Is Bristol Blackburn about to meet the love of her life…or her killer? After the death of her parents, Bristol Blackburn’s life is thrown into chaos and she’s forced to move to Spirit, a small town where shadows are stirring. As she learns to navigate her new school and figures out how to keep her psychic abilities secret from her family, Bristol comes face to face with the boy who makes a regular appearance in her dreams: the gorgeous, possibly deadly, Payne McKnight. Soon she’ll find out if Payne will be the love of her life, or the end of it — and she has no idea which possibility scares her more. And that’s not even the worst of it. Strange shadows are haunting her dreams, and they’re up to something that could put Bristol and the lives of everyone she loves in jeopardy. “I’ve never met anyone like you before in my life,” Payne said. I didn’t answer, but I didn’t need to. I looked up into Payne’s magnificently dark blue eyes and saw it. The emotion that I always saw in my Payne loves me dreams. It was the look in his eyes he got when we were making love, or at least would get if we ever did. There was a connection between us that went beyond anything I’d ever known. I knew Payne could feel it, too. Payne brought his other hand up, gently caressing both sides of my face. In that moment there was no doubt he would kiss me. I was ready. I didn’t care about anything else. When I heard the laughter from behind me of a little boy, it took me a second to blink back into reality. I backed away, and Payne’s face fell. “We’re not alone,” I explained. Jared McKnight had appeared, his little dog sitting obediently by his feet, its tail whipping back and forth. Jared had his hands by his eyes as if ready to cover them. A huge smile was plastered on his face. I closed my eyes and sighed. Well, he was! 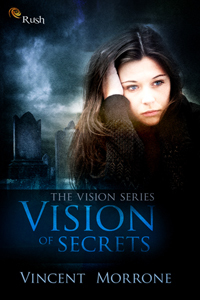 Vision of Secrets (Vision #0.5) is the prequel to Vision of Shadows (vision #1). Bristol understands secrets. She’s got plenty of her own, ranging from the annoying ghost that keeps showing up and attempting to sing Copacabana, (badly) to the visions of a terrifying future that is getting closer each day. Bristol knows secrets can kill. She’s getting flashes of a boy racked with guilt over his secret. And a girl who’s prank might lead to someone’s death. Vision of Secrets is a free prequel introduces you to Bristol Blackburn before the explosive events in Vision of Shadows and let’s you see how a young girl deals with her Visions of Secrets! There is a tour wide giveaway for the blog tour of Vision of Shadows.